Dubspot presents a series of immersive sound design workshops at Dubspot LA highlighting Native Instruments’ Komplete 10 and S-Series Keyboards with instructors James Bernard and Bon Harris. 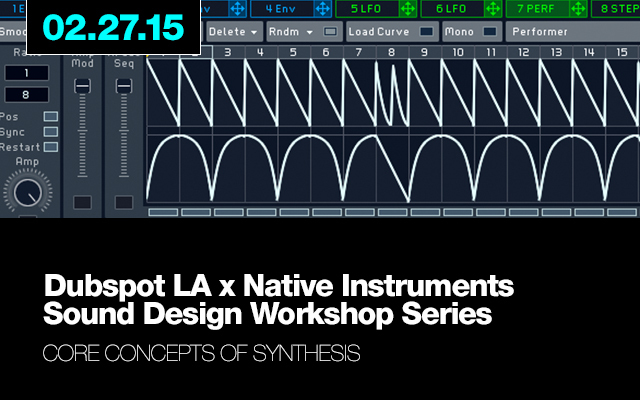 The first event, Core Concepts of Synthesis, kicks off this Friday at Dubspot LA! Sound Design with Komplete classes start soon. Enroll Now! Dubspot presents a series of immersive sound design workshops at Dubspot LA highlighting Native Instruments’ Komplete 10 and S-Series Keyboards. Sound Design course instructors James Bernard and Bon Harris will explore this package of instruments and effects while offering tips on how to craft your own sounds along the way. All attendees will be eligible to win a Sound Design course at Dubspot LA. Understanding the difference between carriers, modulators, and operators. In recent years, James Bernard has become known as a guru of sound design and synthesis, worked as a product specialist for Propellerhead’s Reason software, and performed for Korg at NAMM 2014. Electronic music fans may recognize the name Bon Harris as a founding member of the British EBM group Nitzer Ebb. Apart from his own band Maven, he has worked with artists such as Depeche Mode, The Smashing Pumpkins, Evanescence, AFI, Avril Lavigne, Bush, Billy Corgan, and Marilyn Manson. In addition, Harris worked as a film and TV composer for popular shows such as Bravo’s Project Runway and Top Chef, as well as NBC’s Treasure Hunters.